xpressSignage fully supports HD external input using a PCI-Express capture device on the Windows platform (Capture / Tuner live TV is not supported on Linux) . This allows you to connect Live signal from HDMI, composite, component and S-Video directly into your Signage presentation. The Live video feed is assigned to any screen division (zone) you choose. It supports full 1920x1080 High Definition interlace / free smooth playback. The mediaTV Capture device is available in 2 versions, internal and external. The external is designed specifically for our xpressBOX while the external can be used with any standard PCI-Express compliant computer. Again, if you own a xpressBOX, be sure to order the External version. The mediaTV capture device allows you to input an external device’s analog or digital input directly into your digital signage presentation and assign it to a specific screen division of your choice. The source can be any Audio / Video device such as DVD, Cable box, Set top box, Satellite dish, game console, camcorder, security camera, tablet and others. The mediaTV capture device is designed to pass all of the video information directly onto the PC video card thus bypassing the central processing unit. This special design offloads an processing from the CPU and provides a super smooth HD image right onto your digital signage presentation. The mediaTV does not have a built in tuner / decoder. This means that you will need to use an analog or digital A/V source such as an external DVD or cable box. 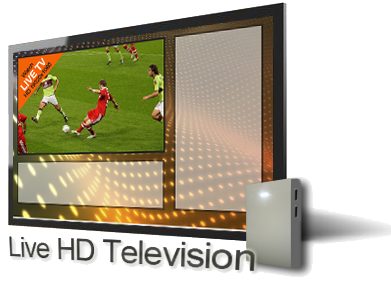 If you wish to use Live TV from Cable or Satellite provider (i.e. : Direct TV / Dish Network) you will use the Cable / Satellite Set top box provided by them and connect the mediaTV using one of the available dongle ports. Selecting channels and controlling the volume is still done through the standard remote control that was supplied by Cable / Satellite provider.